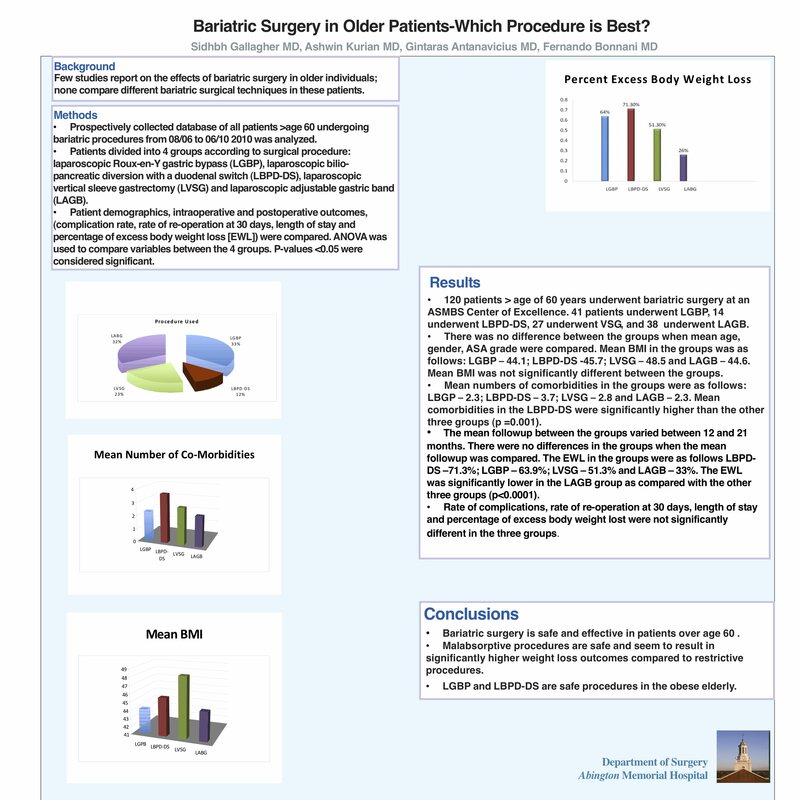 Bariatric Surgery in Older Patients- Which Procedure Is Best? There has been little reported on the effects of bariatric surgery on older individuals. No studies have compared different bariatric surgical techniques in this group. A prospectively collected database of all patients undergoing bariatric procedures between August 2006 to June 2010 was analyzed. Patients over the age of 60 were identified. These patients were divided into 4 groups depending on their surgical procedure: laparoscopic roux-en-y gastric bypass (LGBP), laparoscopic bilio-pancreatic diversion with a duodenal switch (LBPD-DS), laparoscopic vertical sleeve gastrectomy (LVSG) and laparoscopic adjustable gastric band (LAGB). Patient demographics, intraoperative and postoperative outcomes, including complication rate, rate of re-operation at 30 days, length of stay and percentage of excess body weight loss (EWL) were compared. ANOVA was used to compare variables between the 4 groups. P-values <0.05 were considered significant. One hundred and twenty patients over the age of 60 years underwent bariatric surgery at an American Society for Metabolic and Bariatric Surgery Center of Excellence. Fourty- one patients underwent LGBP, 14 patients underwent LBPD-DS, 27 patients underwent VSG and 38 patients underwent LAGB. There was no difference between the groups when mean age, gender, ASA grade were compared. The mean BMI in the groups were as follows: LGBP – 44.1; LBPD-DS -45.7; LVSG – 48.5 and LAGB – 44.6. The mean BMI was not significantly different between the groups. The mean numbers of comorbidities in the groups were as follows: LBGP – 2.3; LBPD-DS – 3.7; LVSG – 2.8 and LAGB – 2.3. The mean comorbidities in the LBPD-DS were significantly higher as compared to the other three groups (p =0.001). The mean followup between the groups varied between 12 and 17 months. There were no differences in the groups when the mean followup was compared. The EWL in the groups were as follows LGBP – 6.7%; LBPD-DS – 62.9%; LVSG – 45.3% and LAGB – 26%. The EWL was significantly lower in the LAGB group as compared with the other three groups (p<0.0001). Rate of complications, rate of re-operation at 30 days, length of stay and percentage of excess body weight lost were not significantly different in the three groups. Bariatric surgery is safe and effective in the over 60 age group. Malabsorptive procedures are safe and seem to result in significantly higher weight loss outcomes as compared to restrictive procedures. LGBP and LBPD-DS are safe procedures in the obese elderly.